It’s not that this is anything new and unlike things we have seen before, but it’s just that this movie does it so well, with amazing style, suspense, and intensity. 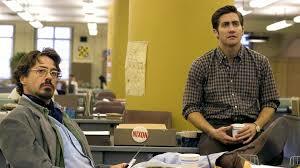 Zodiac is a very cool movie. In the hands of director David Fincher, it’s another major success for his career. This guy handles the serial killer like nobody else. While he’s been around the genre before, this is his first time doing a period piece, and boy does he deliver. The first half is all about the Zodiak pulling the strings and running the show, and it’s a little slow at times. The second half, however, is about our renegade hero, Graysmith (Jake Gylenhaal) pursuing the case on his own, and this is where things really take off. It’s a great movie, stylized to the extreme the way that all of Fincher’s movie are, and it gets to be incredibly interesting. 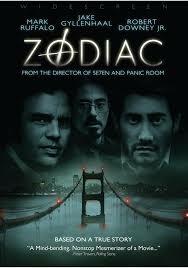 Zodiac is a pretty cool serial killer movie. It’s a genre film, made by the director who is the best at doing this genre. David Fincher. This is the guy who directed Seven, Fight Club, Panic Room, and Gone Girl. He knows the ins and outs of a police station and what detectives go through, but here, with Zodiac, he has something a little bit different to work with. A period piece. The movie takes place in the sevneties, and like all of Fincher’s films, it is very much about the environment. Fincher is a director who is a master of style, but never at the expense of story (as opposed to someone like Michael Bay.) Instead, Fincher uses his yellow and oragne lighting to add to the mood and suspense with every one of his pictures. 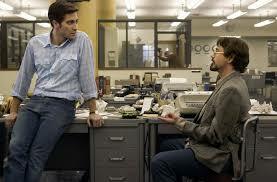 With Zodiac, he uses it mostly in the newsrooms and police station scenes. Other than those locations, this movie mostly takes place outdoors, on the street, or in the homes and work places of suspects. The movie opens with a Fourth of July evening date. A young man drives down the street and picks up a woman. Together they go to a diner, only decide not to stay. Instead, they decide to visit an overlook make-out spot and park there for a little while. All of a sudden a car pulls up next to them with bright headlights on. Now there is nobody else around in this secluded region, so the car pulling up beside them is a little strange. But then the car takes off. Everything seems okay again, and the couple relaxes. And then they hear it. Screeching tires, far off down the road. Suddenly the headlights of a car are back and the car is speeding towards them. The driver gets out, aiming a flashlight at the kids, making them think he’s the police. Then he opens fire and shoots each of the victims multiple times. And this is how the movie begins. The next sequence takes place out in a field in Napa Valley, California. A couple is having a picnic, lying out on a blanket. The girl is looking off into the distance and mentions that someone is coming towards them. The boy doesn’t take her very seriously until the person is upon them, dressed in black that includes a mask, and holding a gun on them. He makes the girl tie her boyfriend up, makes them both get down on the ground, and then proceeds to stab them both in the back. These two murder / attack scenes open the movie. They definitely set the very dark and disturbing tone. During the Napa field sequence, for example, Fincher stays on the faces of the characters the whole time, as they are being stabbed and feeling the pain. It isn’t until after we see two different examples of the killer attacking that we finally meet our protagonists. Robert Graysmith (Jake Gylenhaal) is a cartoonist working at the San Francisco Chronicle. The newspaper offices receive a letter from the Zodiac killer and Graysmith is there in the room (along with many others,) when it is read aloud. There is a code in the letter which includes symbols from all different languages throoughout history. Graysmith tells them that even when they crack the code, the killer won’t be revealing his name. As Graysmith leaves, he notices a man who was also there at the meeting, Paul Avery (Robert Downey Jr.) now at the bar with the big shops from the office. Avery is a reporter. He’s like a local celebrity or the big man on campus. And he doesn’t even know that Graysmith exists. That all changes when the code is cracked and it turns out that Graysmith was right. The Zodiac did not reveal his name. Suddenly Avery wants to be Graysmith’s best friend. He can’t believe this kid was able to predict this. I like the way all of this is setup, with Graysmith seeing Avery at the bar with the others, but it should have taken more for Avery to really want to pick Graysmith’s brain. Just guessing that the Zodiac wouldn’t reveal his name doesn’t seem like enough. Still, I suppose it shows how sure everyone else was that the code would indeed be revealing this. After The Zodiac writes a few more letters to the newspapers, and they struggle with the dilemma of whether to publish the letters or not, we see an investigation from the police perspective. This time there’s a muder inside a cab. It is the cab driver who is shot dead. The police detectives arrive on the scene and we meet Inspector David Toschi (Mark Ruffalo), and his partner, Inspector Armsrtong (Anthony Edwards.) It is great to see Edwards acting again, after his ER days made him a temporary celebrity. Unfortunately, the investigation isn’t especially interesting. The detectives get a warrant and bust into Lee’s trailer, but they find nothing to pin on him. On top of that, they have a handwriting expert (the great Phillip Baker Hall,) examine a sample of Lee’s handwriting up against a Zodiak letter. He decides that there is no way the same person could have written both things. And so they need to get Lee go. No more murders happens for a while. Years go by. Suddenly it’s four years or so later and the only one who is still pursuing the case is Graysmith. He can’t get it out of his head. Graysmith is writing a book about the situation, and continues to investigate it on his own.